This dazzling cluster ring is sure to draw attention. Featuring 9ct white gold and 15 point diamonds in a cluster and down the shoulders, this dazzling ring will make a breathtaking gift for a loved one. 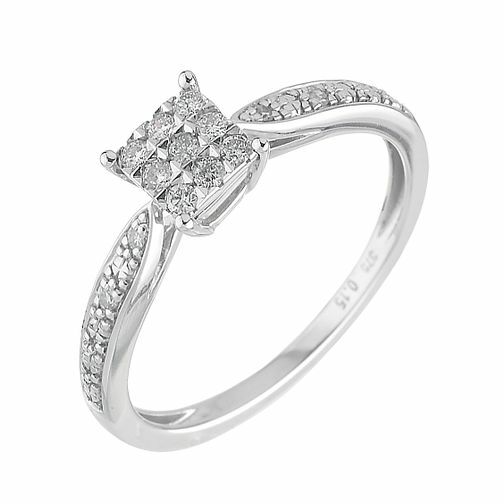 9ct White Gold 15 Point Diamond Ring is rated 4.3 out of 5 by 33. Rated 5 out of 5 by Anonymous from Great service I seen this ring on hsamuels website. I wanted to get the prefect ring for my partner but didnt have time to go instore without her. I ordered it and without 2 days i was able to run into store and pick it up. H Samuel emailed to keep me informed when it will arrived so great communication Loughborough store was clean and tidy when i arrived and great service from a young gentleman. Wish i new his name as he was very professional when getting the ring. Great experience overall and will recommend to family and friends. Thanl you.